By actually pronouncing the names of the displaced, this work creates a room where they may remain. 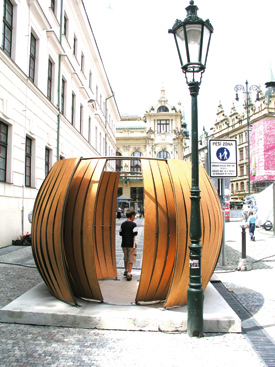 Being a walk-in sculpture, the sound installation is source as well as a resonant cavity for the reverberation that is heard. The room's special architecture works in a way as to transmit the echoes of the names to the outside - a polyphonic and blurred noise that only turns into discrete sounds once the listener actually enters until finally at the very core of the room every single name can be heard clearly. Going all the way - from the collective, blurred commemoration to a distinct recalling of individual names - is the notion of remembrance that this work advocates: its acoustics gives the installation an immediacy that opposes the solidifying of history and promotes remembering as a process of active participation. Loudspeakers installed in between the walls of the room produce the reverberation to be heard outside while the speakers inside broadcast the individual names. Due to the construction's spherical shape, the names are most explicitly heard at the core of the room.